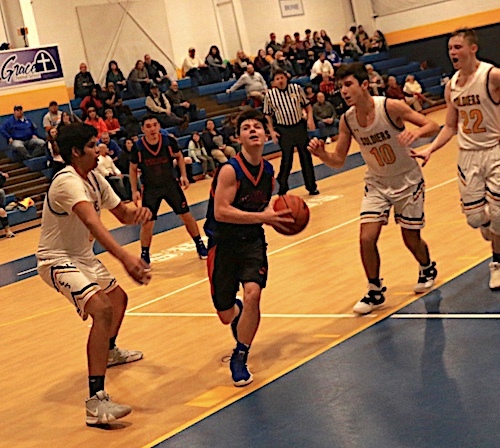 HUNTINGTON, W. Va. — Playing for the first time in 13 days, Tolsia ( 7-2 ) Boys squeaked by with a 57-53 victory over Grace Christian ( 3-9 ) on the road Thursday evening. Jacob Mollette eyeing the basket for a three point attempt against Grace Christian. Mollette finished with 4 three’s in the victory. The Rebels won their fifth game in a row and surpassed their win total of last season.Tolsia didn’t look rusty at all jumping out to a 7-0 lead over the Soldiers and led 15-4 after one quarter. Grace Christian did not go quietly and began chipping away at the lead in the second quarter with a 18-12 advantage to trail 27-22 at halftime. In the third quarter Tolsia pushed the lead back out to 9 points and eventually led 45-40 heading to the final stanza. In the fourth Grace Christian used a 9-2 spurt to take the lead for the first time at 49-47 before Freshman Jesse Muncy scored 7 of the last 10 Rebel points including a 3 point play with the score tied at 53 with a minute left and Tyler Johnson sunk 1 of 2 free throws with 3 seconds left to set the final margin. Jesse Muncy splitting the Grace Christian defense for a huge basket in the fourth quarter. 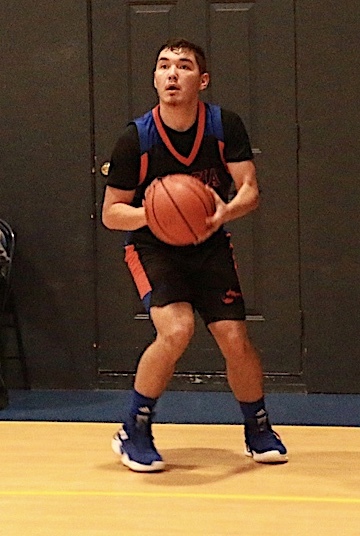 Jesse Muncy led a trio of Rebels In double figures with 21 points, Jacob Mollette hit 4 three pointers and finished with 14 points, Rob Cantrell tallied 10 points, Zach Ball chipped in with 6 points, Tyler Johnson had 4 points and Peyton Watts had 2 points. THS hit 7 three pointers and went 2-7 from the foul line. GCS hit 6 three pointers and went 3-3 from the line. Tolsia will return to action tonight when they host Section opponent Sherman at Rebel Arena JV at 5:45 and Varsity at 7:30.